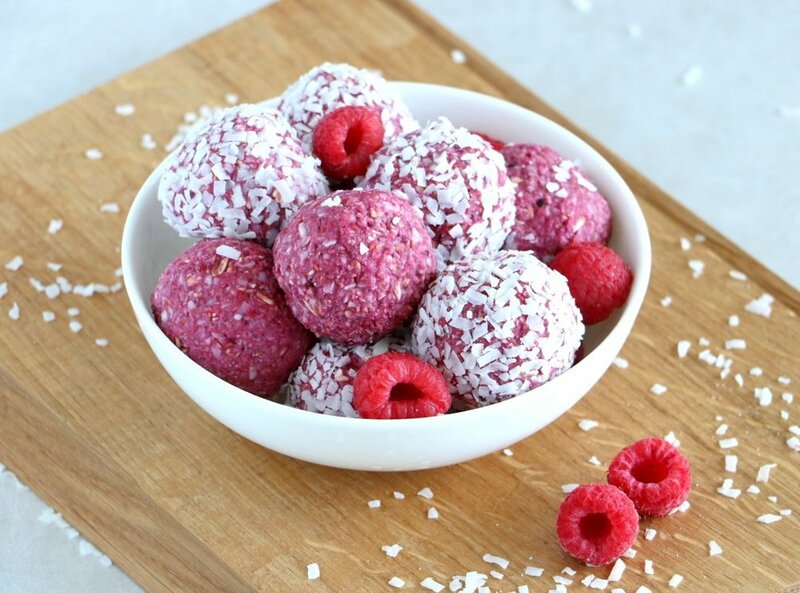 Raw, vegan and gluten free, these pink berry bliss balls will take you only five minutes to prepare. They make a lovely healthy snack to enjoy anytime of the day. * Possibility to replace coconut flour with almond flour if desired. ** You can replace agave or maple syrup with 4 pitted fresh dates. If using them, adjust the quantity of water to moisten the texture. Place all the ingredients in a food processor and mix until you get a sticky dough. If too dry, add a few drops of water. With your hands or using a small ice cream scoop, shape the balls. Optional: coat with shredded coconut or unsweetened cocoa powder. Let set in refrigerator for at least one hour before serving. Store in an airtight container placed in the refrigerator for up to one week, or up to one month in the freezer. Enjoy! By: Delphine Fortin, Del’s Cooking Twist. Find original recipe here!